Unless otherwise noted, all meetings will be held at the St. Catharines Museum at Lock 3, 1932 Welland Canal Parkway, St. Catharines, Ontario. Free admission. Doors open at 7:00 p.m., presentations begin at 7:30. Guests are welcome. Lecture Program – September 2017 to June 2018. Programs are subject to change. Thursday, September 28, 2017: “Guided Spirit Walk tours at Victoria Lawn.” Adrian Petry, Visitors Services Coordinator at the St. Catharines Museum, will talk about what it takes to put on the Guided Spirit Walk tours at Victoria Lawn. The lecture will feature some of his favourite research materials from the collection. Thursday, October 26, 2017: “Mapping the Historic Welland Canals one lock at a time – My Story.” Colleen Beard, Map Librarian and Head of the Map, Data & GIS Library at Brock University, will present her Historic Welland Canals Mapping Project that portrays the First, Second, and Third 19th century canals as they appear on today’s landscape. She will share her stories of the mapping adventure and demonstrate the interactive website where the digital content can be explored by others. drsundy@vaxxine.com to participate. The ability to participate is open to everyone with a good story. Thursday, January 25, 2018: “The Morningstar Mill.” Carla Mackie, Historical Services Coordinator for the City of St. Catharines will give an illustrated talk about the Morningstar Mill. Thursday, February 22, 2018: “Welland Canals Landscape.” Terry Hughes Welland historian will recount the evolution of ships, the traffic organization, the Welland by-pass and the accidents to ships and canal structures. Thursday, April 26, 2018: “Turney’s Crossroads.” Dr. Laurence Steven, retired professor of English at Laurentian University in Sudbury, will explore the different manifestations through time of the area surrounding the point once known as Turney’s Crossroads – where St. David’s Road crossed Davis Road just north of both Lock 21 of the Third Canal, and the old Thorold Cemetery. Thursday, May 24, 2018: Andrew and Jennifer Humeniuk will have an illustrated presentation about their plans for assuring a secure future for the 200 year old John Brown house on Pelham Road in St. Catharines. As one of the oldest buildings in the area, the Humeniuk’s work is very important. Thursday, June 28, 2018: Group lecture from Lock 3 museum staff on preservation of your historical treasures at home. They will describe how to handle and store objects. Tanya Faulkner, Collections Technician-Artifacts, will describe conservation techniques. Helen Booth, Collections Technician-Archival, will describe the research services available at the museum which are available to individuals. Happy New Year from the Historical Society of St. Catharines. We hope to see you out at many of our meetings this year. Meetings in the Winter 2009 – 7:30 p.m. – all held at the St. Catharines Museum at Lock 3, 1932 Welland Canal Parkway, St. Catharines, Ontario. Free admission. Doors open at 7:00. Guests are welcome. January 28 – ” Cholera Reaches Niagara 1832″ by Elizabeth Finnie – Society Secretary. With all of the pandemic talk these past few months, this is a timely look at a serious outbreak in Niagara over 170 years ago. February 25 – “Charting the Great Swivel Link – Maps of the First Welland Canal” by Alun Hughes – Society Member. What better way to explore the history of the early Welland Canal than through a look over the maps of this important system by Brock University’s resident cartography expert and local historian. This month, the St. Catharines Museum made a collection of glass plate negatives available for viewing to the Society. These images come from the Bertha Shickluna Collection. The box of negatives were found in a basement when the Shickluna’s were cleaning up. The box and photos were not in very good shape. They were offered to the Museum with the message, “if you do not want it, throw it out.” Fortunately, the Museum immediately recognized the importance of the images and decided to keep the collection. The photos were sent to the Canadian Conservation Institute in Ottawa. The CCI stabilized the images, cleaned the glass and made working prints of the photos. The bulk of the collection features the Port Dalhousie area around the turn of the 20th century. The collection shows buildings, people and a lifestyle that truly takes you back in time. This has become one of the more important photo collections at the St. Catharines Museum. Sample image: A sloop and grain elevator in Port Dalhousie, Ontario. Bertha Shickluna Collection, 1982.223.74, neg. N4848. It isn’t everyday that you turn 215! 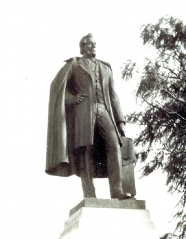 The Historical Society will be celebrating William Hamilton Merritt’s birthday on Thursday, July 3. The event will take place at 7:00 p.m. at the Merritt statue on St. Paul Street at the east end of the Burgoyne Bridge (opposite of the Cenotaph). It will include a historical walk around Mr. Merritt’s old neighbourhood including sights of the first and second Welland Canals. 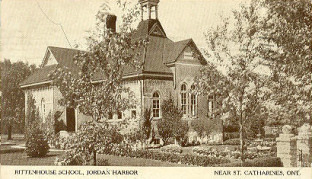 Jordan Harbour – Located along Lake Shore Road and on the Twenty Mile Creek, this village was primarily a cottage community but at its height boasted a post office, railroad station, school, town hall, stores, warehouses and more. The construction of the Queen Elizabeth’s Way (QEW) appropriated enough land to effectively end Jordan Harbour’s time as an independent community. Silverdale Station – Situated along the Toronto, Hamilton & Buffalo Railway, this village grew from being merely a grain loading stop on the rail line to include a general store (complete with a post office and agricultural cooperative), a church and a school. Shipyards / Miller’s Bay – A planned community along the Niagara River established by the Canadian Shipbuilding Company in 1903. The Company built an impressive shipbuilding yard in Miller’s Bay and provided lodging houses for its employees. Along with a number of these boarding homes, Shipyards also had a hotel, railroad station and a post office. In 1913, the post office changed its name to Miller’s Bay and so did the community. When the Company left the area, the village diminished soon afterwards. St. Johns on the Short Hills – Probably the village with the greatest potential to be something bigger, it was established early by Benjamin Camby and John Darling around 1790. Camby immediately established a saw mill. Soon afterwards, St. Johns became a prominent industrial village complete with grist mills, fulling mill, woolen mills, iron foundry, potashery, tannery, brickyard, schools, churches and a post office. The fate of the village took a sour turn with the opening of the Welland Canal which drew away people and commerce. The final blow was when the railroads were constructed and no lines were built through St. Johns. Some other vanished or severely diminished villages noted included: Decewtown, Reynoldsville, Power Glen, Thorold South, Window Village, Homer, Stromness, Blackhorse Corners, Netherby, Candisville, Brookfield Station, White Pigeon and Caistor Center. With so much potential and promise, it makes one wonder what our current villages, towns and cities will be like 100 years from now. This was also the Society’s annual general meeting. It was a very good year for the Society. There are about 180 active members in the Society. All reports were positive and we are moving forward with good programmes and direction. 2008 / 2009 promises to be another excellent year. The Society’s Executive remains the same from last year. See who the Executive are under the Executive tab at the top of this page. There is a special gathering for the Historical Society of St. Catharines on May 10 at 11:00 a.m. for the annual Oille Fountain Potting Ceremony. As well, the Society will be part of the official historical designation ceremony for the old Grantham Town Hall in downtown St. Catharines – not far from where the potting will take place. All are welcome to attend. See more details under the Special Events tab. The next regular meeting of the Society is on May 22 at the St. Catharines Museum at 7:30 p.m. Pat Menon will be presenting on W.B. Allan – a St. Catharines’ Architect.